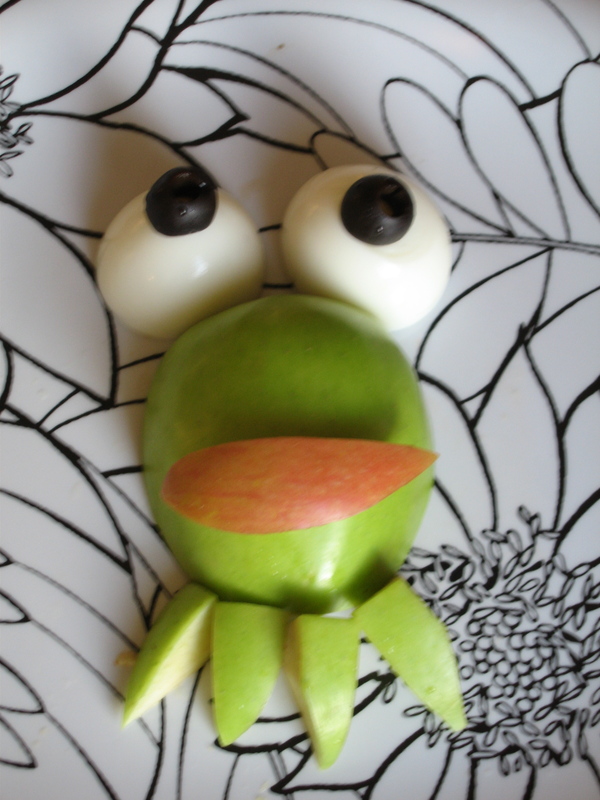 It ain’t easy being green, but it sure is tasty! Use apple slices, a hard boiled egg and black olives for this healthy fun snack. One of my favorite memories is the snack my mom fixed me when I came home from school. It was just enough food, love and thoughtfulness to get me through the homework (or after school sport) crunch before dinner. I can still taste the homemade cinnamon applesauce I dug into as my little feet dangled from the kitchen table chair–a fitting thrown to share my elementary adventures of the day. Here are some healthy snack ideas to munch on and share while you listen to your own little (or older) trooper’s woes and adventures. Frozen Yogurt Pops: mix plain greek yogurt with chopped fresh fruit, place in a paper cup or popsicle mold with a popsicle stick, cover it, toss it in the freezer for 3 hours (or until frozen) and take it out for snack time. Add in vanilla, raw cacao or cinnamon. Hummus and Veggie Sticks: yes, kids will eat hummus especially if you tout its yumminess. Serve it with your kids favorite veggie like carrots, celery or red bell peppers. Play Bonus: use the hummus as the center of a flower and the veggies as the stems and petals. Guacamole and Veggie Sticks: Serve it with your kids favorite veggies, but watch the spiciness, unless, of course, your kiddos like spice. Play Bonus: use the guacamole as a monster face and the veggies for eyes, nose and mouth. Awesome Sauce: mix almond/cashew/sunflower seed butter with plain (no sugar added) applause and cinnamon. You can add a couple of whole nuts for extra fun crunch. Nuttin’ But Fruit: grab your kids favorite fruit and serve it with some nuts or nut butter a la apple with almond butter. Play Bonus: use the almond butter as the center of a flower and the veggies as the stems and petals. Ants on a Log: An oldie, but a goodie… put almond or sunflower seed butter on celery and line it with a few raisins or currents. Baked Apple Nutty Goodness: serve it with a little almond or coconut butter and a sprinkle of cinnamon.